My name is Sherri, and I am a single mom, raising my two daughters on our rehab mobile home that I bought for $800. Into a lot of neat things, such as graphics arts, bluegrass, homeschooling and working from home as well as gardening and urban homesteading… Read along and learn more about us! 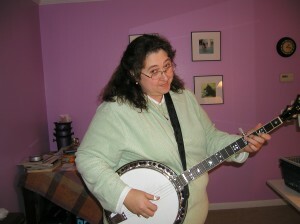 This is me when I first got my current banjo… a Stelling Bellflower… about oh 7 years ago. Wow. Hard to believe it’s been 7 years since I got back into bluegrass! I’ve seen these lists online, and well, I love lists and I thought it would be interesting to compile one about myself and see who I really am. Here goes nothing… it might take me awhile, but I’ll give it a try. 1. I was born in Falls Church, Virginia on the day of John F. Kennedy’s funeral. 2. I am a Sagittarius but I don’t hold a lot of faith in that stuff. 3. I’m a huge fan of positive thinking. 4. I think I’ve done quite a bit in my life and I think I’ll do quite a bit more. 5. I love the color purple. 6. I am a graphic designer, web designer, photographer, artist, musician and good all purpose crafty person. 7. Overall, I’m a very content person. 8. I think I’m a pretty loyal, moral and honest person. 9. Sometimes I hold grudges a teeny bit. But I’m trying to get over that. Really, I am. 10. I wear my heart on my sleeve. 11. My emotions are very easy to read by my friends. 12. I like to take naps. 13. Reading is very important to me. 14. I don’t have a lot of family ties really. 15. I have two wonderful, beautiful and amazing daughters. 16. I was married for 17 years. 17. I lived in San Diego for 3 years. 18. I lived in Pontiac, Utica, Farmington Hills, Novi and Berkley, Michigan. Not all at once. 19. I lived in Toledo, then Perrysburg, Ohio and then moved out of state and moved back to Toledo. 21. I love to play the banjo. 5 string, bluegrass thank you very much. 22. I think my favorite bluegrass folks are Del McCoury and his boys, Blue Highway and Ronnie Bowman. 23. I’m very proud of founding the Glass City Opry with two of my best friends. 24. I really like dogs, chickens and horses and ponies. 25. I love to garden and was thinking about being a Master Gardener and taking the test awhile back. But I didn’t, and that’s okay. 26. I’ve playing in two bluegrass bands in my life. Fulton County and Deepwater. 27. I really like writing songs and I think I’m not too bad at it, when I write with my co-writer partner. By myself, I’m a little rough at it. 28. I’m really really involved in bluegrass, probably too much. 29. I love peaches and home grown strawberries. Oh yeah, and home grown tomatoes and sweet peppers, too. 30. I would eat too much potato salad if I was allowed to. 31. I am a Pepsi addict. 32. I love my Taurus station wagon. 33. I like to do crafts… knit, crochet, quilt, bead, hook rugs, watercolor, make soap, make candles and scrapbook. However, I don’t seem to leave enough time in my life to much of them. But soon… someday, I’ll be able to. 34. I have been working on my own, as an entrepreneur for 16 years now. 35. I helped design the Ford Motor Company’s ECPL Lockout program and I have a letter to prove it. 37. I used to play Dungeons and Dragons… a lot. Yep. I was even a dungeon master, or well, mistress. Hahaha… don’t beat me up. 38. I was a real nerd in school. 39. I own a pair of gerbils right now. As an adult. Yep. Lester and Earl. 40. I love my old lady Belgian Sheep Dog…. Johnsondale’s Shadow Dancer… lovely old sweetie Gypsy to me and you. 41. I showed Gypsy as a young dog and we even won a Best of Breed once at a show! 42. I worked at a horse stable as a teenager and absolutely adored it. 43. I want a hobby farm soon, before I die. And before I’m too old to take care of and enjoy it. 44. I won an award from the Detroit Zoo for a ink drawing of two Imperial cranes that I entered in a school contest about 13 years of age. 45. I have a daughter with Autism. 46. I have a bum knee with arthritis in it. 47. I could definitely loose a good deal of weight and be a healthier person. I’m working on it. 49. I love writing and have written one and half unpublished novels… 4 or 5 published articles and a bunch of free newsletters and such. 40. I run over 60 websites. And own a small publishing company with my daughter and a BMI music publishing company with a partner, too. 51. I am not a morning person, but I try to be a lot and it usually messes me up. 52. I must admit, one of my most favorite movies of all time is Lawrence of Arabia. 53. I read several biographies of T. E. Lawrence as a teenager and several of his own books. 57. I am a Christian, and I believe in the Lord but I’m not a regular church goer. Maybe someday. 58. I do believe that God has a special purpose for each of us and that we do not always know why or how the mysteries of our lives will unfold. I don’t believe that life is just a random string of events. 59. I used to be a lot more negative and depressed about life in general. But not anymore. And never again. 60. I’d like to go to Great Britain some day and travel around for at least a month and go to all the countries there. 61. I adore Celtic music but I can’t listen to it over and over. 62. If I just had to pick on looks alone, I prefer dark haired men over light haired men. 63. I much more at home with men friends then women friends. 65. I’m secretly jealous of those women that have super close girlfriends. 66. I’m probably a bit too sarcastic at times for some people. 67. My sense of humor can be a little weird at times and probably most people don’t get it. Some do. You know who you are. 68. I am too generous for the most part. 69. My generosity gets me in trouble often and I go without. But not for long. 70. I have a super close friend that I’ve never met in person. She’s my daily companion in life and we share our lives and jobs and loves and fears and all that stuff. 71. I wish I had someone to learn how to ballroom dance with. 72. I know every pot has a lid, but sometimes I’m afraid that at this point of my life my true lid is off with the wrong pot and just wedged on that pot weird-like and stuck and will never find me. 73. I want a pony. Dappled grey and with a light mane and tail. 74. I really hate seafood. I’ll admit it. I’m not even much of a fan of fishsticks. 75. My favorite desert is strawberry shortcake. 76. I got 100% on the old SAT test where you had to deal with spacial situations and know how pieces of cubed things unfolded and what would fit where, etc. 77. As a result, I can pack cars, boxes, closets, etc, with amazing accuracy and very little wasted space. 78. In high school, I took a test that said I would make a good florist…. or an undertaker. 80. I homeschooled my children for almost their whole careers and my eldest got a 4.0 in her first semester at college! I guess I did something right all those years. 81. I love dangly earrings. 82. And I like silver over gold for the most part. Especially in jewelry. 83. I’d like a yurt someday. 85. My favorite banjo in the world is a Stelling banjo. 86. I’m going to win the lottery some day. I am. I’m planning on it. 87. I prefer button up shirts to pull over shirts for myself. 89. I really like margaritias. And Olive Garden. Or Pasta Fina too. 90. I love playing music in a band. It’s one of my most favorite things to do. 91. I like to read historical books about the Middle Ages and old Persia and the Middle East. India too. But not Oriental times. 92. I was a excellent wench in the SCA. 93. I’ve only romantically kissed 3 men in my life. 95. I love earthy and Raku style pottery. 96. I want to get back into making pottery. 97. I am a master procrastinator, but I always seem to make the deadline, but it’s right at the nick of time. 98. I wish I was better with money. 99. I wish I was better with exercise and all that jazz. 100. People think my graphic art design is pretty good. I think I’m fairly competent with it and enjoy using it to help myself and others. 101. I’m not afraid to die, but I hope it’s not painful and drawn out or anything. I’m not really wanting to go, but I’m not that worried about it, either. I think I’ve done a lot and laid a good foundation in my children and raised them up good and strong and have wonderful friends and family that will cherish my memory and miss me when I’m gone. What else can you want for this mortal life? Ok, my family has become a fan of you and your girls over the Moby transformation. You guys did more than an amazing job. I knew a lot of these things!!!! I miss you!!!! We NEED to get together and have coffee…ok, Pepsi and Diet Coke!! It looks like you have found your calling. Mike and I are VERY HAPPY for you. Your website is wonderful! I just got done reading about You, very interesting,as is knowing You! I’m so glad Our paths have crossed and hope We can be 4ever friends. I so love Your visits to get eggs. Maggie and Jessie are awesome as You! Oh, Francine! I luvs you tooo!!! You gotta come over and visit the Moby some time soon before it gets all dead and cold outside! I’m sorry I missed your calls last week! I was silly busy with the music stuff, but I’m not so busy now!!! I was viewing some of the Bluegrass vids, they are awesome! You have become my new role model. Found your old site last night in a link from You Tube where I watched 6 or 7 of your videos. I was disappointed that you had “stopped” blogging in 09 and still have to do a search of your archives to find out whether the arsonist was ever caught. You are amazing. Wish I had the abilities that you’ve got. I’d like to think I’m made of the same stuff as I make my own soap, bread and want to start canning when I move to Tucson. But I think I may be all hat and no cattle. I share the same attitude about money and things and have always been fascinated by old cars and mobile/manufactured homes. I am currently attempting to buy one of two different mobiles: one turnkey and the other beat up and a lot less money, both include the land and my Mother is nearby and brother and wife about 7 miles awy. The turnkey one would be the best, but my heart goes with the beatdown place. When I do it I will be using my house sale proceeds to liberate myself from a mortgage, land or apt. lease, or rent. I look forward to not being held hostge to a toxic job just to maintain house payments and credit card debt. I described you as my new hero. You’re an inspiration and I emailed a link to both your sites to friends and family. I look forward to further exploring your current site and watching more of your videos. You’ve truly got a new fan. BTW: what happedn to Lumi ? Lester and Earl : as in Flatt and Skruggs ? Best of everything to you. You sure gave my ethusiasm for this big life change a big boost. All I can say is thanks. I really love that you saved that moby and made it something special. The rest of the world doesn’t get it and even without winning the lottery you’ll be rich on all the levels that matter. Aw shucks Dave… that’s so nice, you almost made me cry! I’m smiling a lot though because you made my day. I don’t think of myself as that special, but I sure like the fact that I can help to encourage others, even if it’s just to make some pickles on their own, or whatever. I love helping others. Well, thanks a bunch for spreading the news about the moby blog! I should go and update those videos and add my new site!!! Or maybe I should go and post on the old blog pointing folks to the new one! I run 60 websites and I never ever thought to do that! haha… silly me. I love that… all hat and no cattle!! hahaha… that’s me. all hat and no money! Lester and Earl, yup, they are bluegrass gerbils. Thanks a bunch! Comment often! I luvs that!!! I was so pleased to see that you had continued blogging with this new site. My brothers and best friend are into bluegrass. Me not so much, but I hope they visit your site and discover how amazing your story is. Your entire philosphy of life is somthing to be admired. How have you been? Your website is just wonderful. I love it! I’m glad things are going well for you and the girls! I hope you don’t mind if I share your site with my parents and sister, they love to garden, can food, etc! BTW, that salsa you made looks fantastic!!!!!!!! YUM!!!! I just read your blog about Lumi. I name my cars too. Mothra is my 63 Plymouth Valiant that I have had for nearly 30 years. He’s already down there in Tucson. Sherri: I meant every word of it. I was so excited to see your web site and your videos. Hard to explain a mobile when everyone around you wants 3000 square feet and stainless and granite. BTW: your Old 83 is just a bit smaller than my place here in Van Nuys that I have been in the process of selling. You made the most of your space and then some. Also checked your music vids and find I really do like bluegrass. At least yours, anyway. Nice. Thanks again for this tremendous insight into your life and urban homesteading. Oh: I got the house in Tucson. A Golden West manufactured in Perris CA. Qui Qui !!!! Oh good! Sounds like a sweet moby! You’ll have to send along some pictures and I’ll put it up on the blog! Yeah, it’s funny how everyone seems to think you need huge to live properly. Been there done that… no, I love my 800 square feet. Perfect. Thanks so much for your kindness! You sound like a super nice person! Hi Sherri. I just wanted to announce that you are the winner of the Tiny House Blog Labor Day book giveaway contest! Kent and I will need your address so we can mail the books to you. Just send me a note via email. We would also like to do a post on you and your favorite tiny houses (gypsy caravans) this week. Congratulations! I am so excited… I’m so not gonna sleep tonight. Thanks. It is. Too big for my tastes and needs, I am embarassed to say, but near my family. I would have loved one of those 70s doublewides with all the paneling and period wallpaper, but expediency and doing the right thing trumped what I want. Those that matched my “fetish” were 25 miles away from Mom and employment. Happy happens anywhere, so I’m excited. And I’ll send pictures. Have only seen internet pictures but it’s nicer than anything I have ever lived in in my adult life. My best friend has already named it “The Big Trailer”. Best of the day to ya. The Big Trailer!! I love it! You should call it the Big Moby! hahaha.. ahem. Best of luck on your new moby! PLEASE send a few snaps when you get it ready and all, we love mobies here and I think it would be fun to start posting reader’s beloved homes too! Hi Sherri, you are indeed multi-talented. The graphics, the music, and the continual creative projects. I think you inspire a wide range of people. Have been reading your blog a while now, and not trying to spam or be off-topic yapping about our business in your Comments, just reaching out. I started building a website this year for a mobile home parts shop, so it’s been open for 30 years and is now online too. Complete Mobile Home Supply, here to help people with parts or with solutions to fix their problem. On a different note, some of my friends are nonstop fiddlers and went up to the Clifftop Jam in WV a month ago. Any chance you’ve ever been to it? I’ve enjoyed watching the progress over the past couple of years and have toyed with a similar idea . . . but for now am absolutely +STUCK+ in a townhouse until the market hopefully improves (I paid $98,000 in 2005 for a mild fixer-upper, poured in another $25,000 for several renovations, and would be lucky to get $70,000 today). The Memphis, TN. housing market was hit hard to say the least!!!! Anyhow, for just the sake of curiosity I have a question for you. Question: I remember reading once where you said you paid around $350 per month for lot rental. Whoa that’s a whale of a price. Down here below the Mason-Dixon—except maybe in Florida—lot rentals are usually rather cheap. What do you get for that kind of money? Does this include any utilities at all? Suggestion: My opinion is only that, but your place would really stand out (“pop” would likely be the word they’d use on HGTV) if you had the upper “trim” of your home painted to match those nice shutters you installed. You know, the upper section along the roof line that was once that root beer brown color. I’d leave the bottom as it is. Some friends down here decided to re-do their family “vacation home,” which is actually a 1976 single-wide that bears a close resemblance to yours. Theirs was meticulously maintained throughout the years, so no real rehab work needed to be done. Still, the white in the middle with burnt orange upper and lower trim needed some modernizing. That which was once white is now gray, the upper trim is hunter green, and the lower trim is a crisp white to match the skirting (wood lattice). The “pimento cheese” shag carpet, green vinyl kitchen floor, harvest gold sinks and fixtures, and walnut paneling are all perfect, so there is no convincing them to update the inside! This sounds strange, but I was just talking with Matthew, Chris and Joey about you all. If you get the chance, shoot me a line back. Talk with you then! Decided to catch up on you today- I always come back to this when we talk about rehabbing a mobile home. Congrats on your new home!! My question is, did you sell the Moby? Did I miss it in the blog? What did you get for it? THANKS! My daughter sent me a link to your blog with the comment that she thought I’d enjoy it. She was right. Not sure I’m gonna tell my sheep about the lights you put around your sheep shack, however. They’d just want their own. Haha. yeah sheep do follow what other sheep are doing for sure! My sheepies are super spoiled…. Glad to have you drop in!!! ENjoy! I saw your new homestead and cried. I mean I literally just teared up. True I cry at Mr. Clean commercials these days but my cup raneth the heck overeth when I saw you in your home. Partially because I’m so happy for you, but also because I felt profound joy that a core belief of mine is true. Living right makes good things happen. You are so deserving and I couldn’t be happier for you and your girls. It’s funny timing too because I’m looking for land of my own right now too. With a house on it is even better. I’m looking forward to reading more details about how this came about so I’ll get back to catching up. I have read alot of your posts. Just finished reading your 100 things. I like you. You are my kinda person. I have an odd sense of humor also and alot of those other things I can identify with. Yep, hope I can spend more time on my blog so you can see the similarities…oh, and I don’t spell well…..giggle! who cares, you get the drift, right? I have chickens, Glenda, K-Ho, Hope, Queenie, Roxie, Merideth (died), Bob (she’s a girl) and one that hasn’t earned a name yet. Love me fresh eggs. We bought our double wide for a bit over 10k and have revamped it. No mortgage here either. We also have 5K debt but I see a windfall coming soon so that will be over. I could go on and on…. Hello. I am writing because I’m a writer representing an online mobile home supply company, and I was wondering if you would accept a guest blog post written by me with a link to the mobile home supply site. The article would be 100% original content with valid SEO and would deliver relevant information to your readers. Sherry I have followed your blog and journey for quite awhile….Yep i am a lurker but all in support of all the awesome things u are creating…I am interested in getting a quote for cleaning and tweaking my wordpress site as i am not finding it user friendly and need some things put into place then i can carry on….Is this something u do?